Pay half at the time of registration (non-refundable) and be invoiced for the remainder due on June 1, 2019, with a $25 late fee to be assessed for past-due invoices after June 5, 2019. This Sacred Hunt course is of an advanced nature and designed for individuals with significant hunting experience OR a desired and dedication to build their own Self Bows and Arrows. 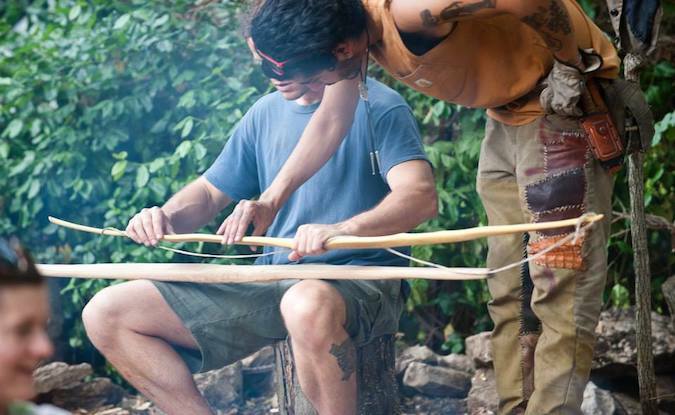 The primary focus of this course will be the ancient art of Traditional Bow Building (building a self-bow from a wild harvested sapling). This intensive will also include a comprehensive introduction to primitive hunting, beginning flint knapping, tracking and pre-season scouting. Participants will be mentored through a complex discovery of scientific principles and creative expression. Students should expect thorough instruction and lots of hands-on experiential woodworking. A variety of tools from sledges and wedges to drawknives, hatchets and rasps will be utilized. Hours of hard labor and focus allows for deep connections to be made between the students and their craft. The secondary focus of this course will be introductions into flint knapping, archery, tracking and gear. All classes are capped at 15 students.